Rely on AQHI Inc. for safe and thorough asbestos ceiling removal in Villa Park CA. Fortunately, there is something you can do right now to eliminate this danger: Invest in asbestos ceiling removal in Villa Park CA from the pros at AQHI Inc. Even just the idea that your ceiling might contain asbestos could be enough to affect the property value and cause you considerable concern. So you might be very eager to get any questionable materials removed ASAP. But before you commit to professional asbestos ceiling removal in Villa Park CA, make sure you have considered the following points that will affect when and how you get you ceiling texture removed. Asbestos content: Just because your ceiling materials are old and suspicious-looking does not necessarily mean they contain asbestos. Before you schedule a professional asbestos ceiling removal in Villa Park CA with a specialty contractor like AQHI Inc., you should consider getting an asbestos test to make sure you really have a problem. Present condition of the material: Asbestos-containing materials only present an active threat if they are damaged and asbestos fibers can escape. Therefore you really only need to remove damaged or deteriorating ceilings. Any kind of asbestos removal project requires expert attention from a certified contractor. This is even more important when it comes to asbestos ceiling removal in Villa Park CA. Normally, asbestos-containing materials are wetted down before removal work begins to help minimize fiber release. This is not possible with ceiling materials that have been painted. Plus, there is the challenge of working with a material that is over the worker’s head, where gravity will be pulling any loosened asbestos fibers right down on top of them. At AQHI Inc., we have earned all the certifications that are needed to remove and dispose of asbestos-containing materials safely, even in the most challenging conditions. You can rely on our thoroughly trained employees to get your asbestos ceiling removal in Villa Park CA done to a high standard in compliance with all relevant rules and regulations. At AQHI Inc., we truly care about the safety of your property. We guarantee that your asbestos removal will be done to a high standard and we can confirm this fact with asbestos air testing after the project is complete. 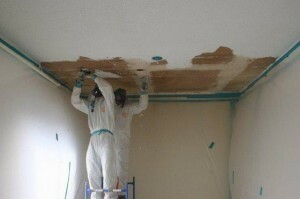 If you would like to learn more about asbestos ceiling removal in Villa Park CA, please contact us at 800-481-8080. Our asbestos removal office for Asbestos Ceiling Removal in Villa Park CA is open Monday through Friday between 8:00 AM and 5:00 PM and closed for lunch from noon to 1:00 PM. With advance notice, projects can be scheduled for weekends, early mornings and evenings.